Poirot and Hastings attend the Victory Ball, a popular costume party. During the festivities, one of the guests is found stabbed to death, and another succumbs to a drug overdose the next day. 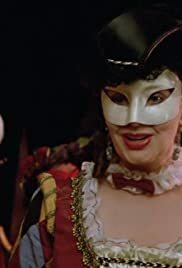 Hercule Poirot: [voiceover] The Harlequinade, ancestor of the English pantomime. Six characters. Garish, grotesque. First brought to life three centuries ago by the clowns and the actors of the Italian fairgrounds. Today, mere costumed characters at a masked ball. Where now their mystery, their magic, their comedy, their tragedy? Poirot and Hastings attend the Victory Ball. A costume party where people dress up as someone famous. Others have gone dressed as classical Italian characters. Poirot has arrived as himself. The dead body of Viscount Cronshaw is discovered, the press is having a field day as the murder took place under the nose of Poirot. Later the police break into Cronshaw's girlfriend flat, an actress called Coco Courtney. Her body is found, due to a cocaine overdose. The featured building in this episode is BBC's Broadcasting House. The climax takes place in a live radio broadcast led by Poirot has he brings the clues together live to the nation. I really did like how Poirot put all miniature pieces together including a daring move to catch the murderer in an off handed way.